Firearm have long had a problem of the barrel becoming overheated when a high number of rounds are fired in rapid succession through the weapon. The barrel absorbs heat primarily from the combustion attendant to the firing of a weapon, and the heat produced both by the friction of the bullet and of the muzzle gasses leaving the barrel. May lead to heat-induces changes within the metallurgical structure of the barrel. It may wrap the barrel, and, thereby, both increase the misfiring rate of the weapon and decrease its accuracy. Overheated weapon is difficult to handle, position, and transport. Accordingly, it is desirable to force an increase in the rate of heat transfer of heat from firearms subject to such conditions. Several of device are intended to be permanently affixed to the firearm, or to be integral to design of the firearm itself. Some have used water or air to cool the barrel; other have use muzzle gasses or a material closely attached to the firearm barrel to conduct heat away from the barrel in an efficient manner. Automatic Gun (George Hookham, 1899): A ribbed, tapered barrel which is fluted toward the breach. The extreme rear end is smooth in order to fit into a bushing, which is contained in the body of the gun. A casing surround the barrel, so that a channel is formed between the casing and barrel. All of these devices appear to require customization to fit each specific firearm. They do not appear to be easily removed or refitted to a different firearm. Many also have been dependent on forcing air or water through a cooling channel, sometimes disadvantageously necessitating the use of auxiliary equipment. It is, therefore, readily apparent that there is a need for an improved firearm heat sink that is easily attached to the barrel of firearm; that provides for easy removal and refitting to another firearm; and, that is lightweight, easy to manufacture, can be rapidly installed, and will easily adapt to a wide variety of firearm. The present invention both overcomes the above-mentioned disadvantages, and meets the recognized needs for such device, by providing a firearm heat sink which is easily removed from one firearm, and easily refitted to another. In all embodiments, an underlying heat conduction material may be provided to fill gaps between the barrel and heat sink, and to provide adequate contact there between. Figure 3 (Fig.1 in Picture): Perspective view of the firearm heat sink of the present invention having one ring remove and one ring in place. Figure 3a: Sectional view of the firearm heat sink showing a non-round cross section. Figure 4: Perspective view of the preferred embodiment of the firearm heat sink attached to a firearm. Figure 5: Perspective view of the two facing tubular halves of the firearm heat sink of the first alternate embodiment. Figure 5a: Sectional view of the heat sink of the first alternate embodiment showing a non-round cross-section. Figure 6: An exploded perspective view of the first alternate embodiment, in position to be mounted upon a firearm barrel. The following picture shows a better understanding of heat sink mostly for all user. 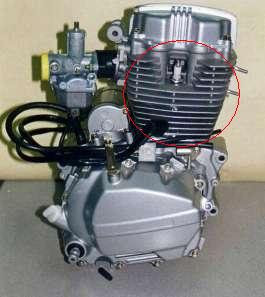 The engine block of a motorcycle or even a car uses almost the same concept of heat sink that invented to reduce heat in engine. The same concept goes to the invention of heat sink for firearm barrel. Engine Block used a heat sink to increase the rate of heat transfer between the engine and the environment. bleh jadi tajuk psm ni.